For my first work-related potluck here in the States, I worked my fingers to the bone making a complex dish from my home country wanting to leave a good impression. Just as I was entering the break room my colleagues shouted in excitement. No, they weren’t happy to see me. The excitement was about another dish. Someone brought a bowl of mashed potatoes! What’s the big deal, I asked. They aren’t your regular mashed potatoes, they exclaimed, they are MADE FROM SCRATCH!!! What the fork?! Why would you EVER have any other kind??? My dish did OK, but it didn’t get the rave reviews as the said mashed potatoes. Although food made from scratch is the best, I never thought homemade mashed potatoes would bring so much joy to the masses. I thought mashed potatoes recipe is not even worth putting on the blog until my daughter insisted I share our home recipe and tell you the secret ingredient. So here it is. Finally, let’s learn how to make the best mashed potatoes from scratch. Take it or leave it and go buy a box of…whatever it is in it, ’cause it ain’t mashed potatoes. Peel, quarter, and rinse the potatoes. Put the potatoes in a pot, add the salt, and cover with cold water. Bring to a boil, then lower the heat and cook until tender but still firm, about 15-20 minutes. Drain them well. Meanwhile, heat the milk and butter in a small saucepan. 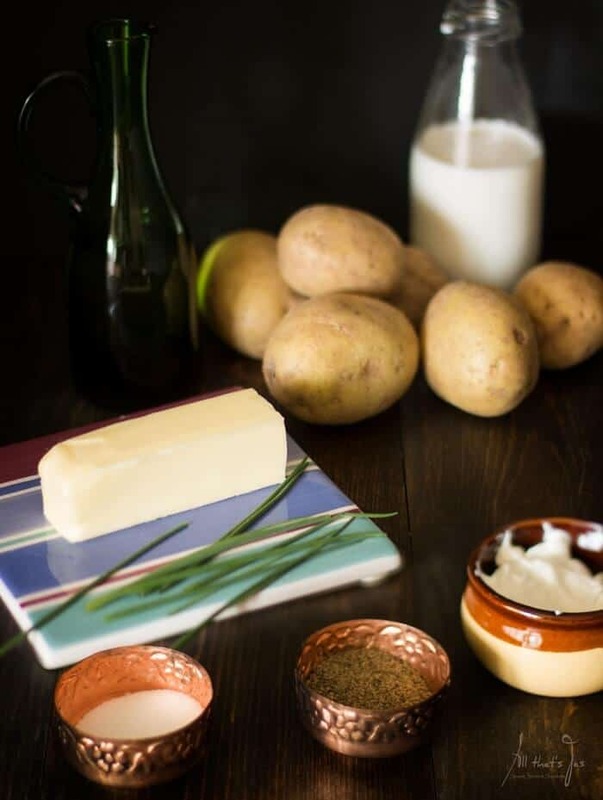 Using a potato masher or electric beater, mash the potatoes with oil and sour cream. Add freshly ground black pepper. Slowly blend milk mixture into potatoes until smooth and silky creamy. Serve alongside red wine goulash or meatloaf with hidden eggs. 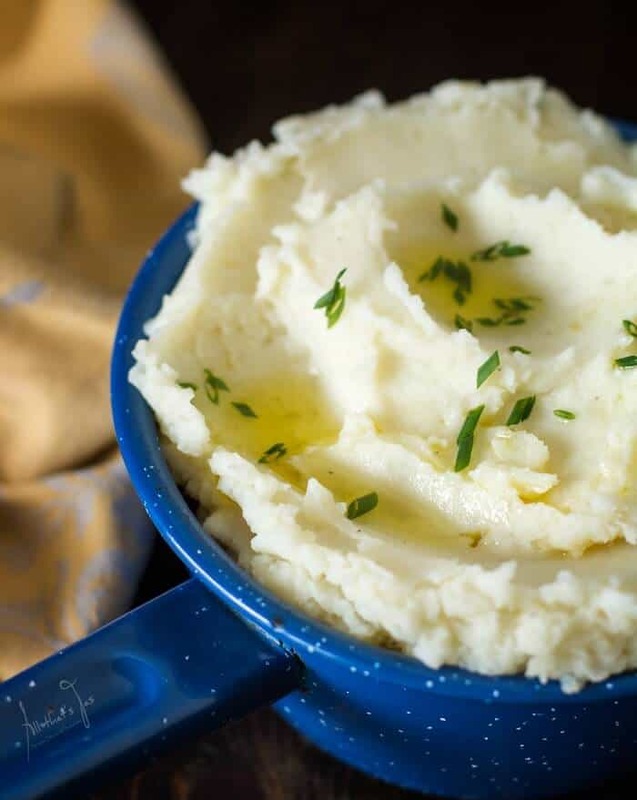 Do you make mashed potatoes from scratch? Let me know in the comments! 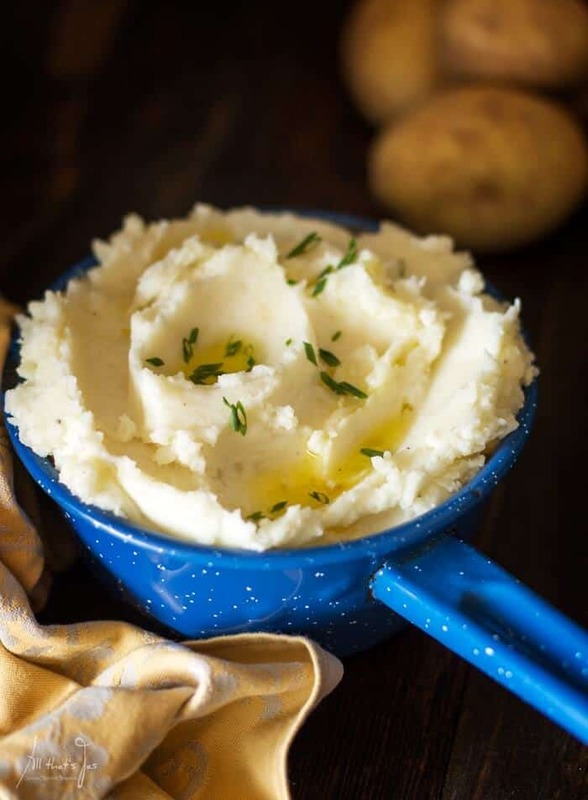 One secret ingredient makes these mashed potatoes creamy and delicious! Heat the milk and butter in a small saucepan. Using a potato masher or electric beater, mash the potatoes with oil and sour cream. Add freshly ground black pepper. Slowly blend milk mixture into potatoes until smooth and silky creamy. Featured on: The Boondocks Blog, Kreative K, and Repurposing Junkie. I, too, have blogged about perfect mashed potatoes because mashed potatoes are my all-time favorite food! But a lot of people make bad mashed potatoes from scratch. And “from scratch,” please! Another secret to perfect mashed potatoes is getting every drop of water out of the cooked potatoes. After draining every drop of water, set the pan back on the burner, put the lid on and let it sit on the heat for about 15 seconds before turning off the heat. Your photos are giving me a huge craving for mashed potatoes (and I just had some yesterday!). Yes, of course, getting the water out! I always do that too but it’s so second nature, I forgot it might be a new information for many. Very important detail, indeed. You’re absolutely right, you CAN make bad mashed potatoes from scratch. Thanks for the reminder! I agree that food made from scratch is the best, best ever! Hands down. All those instant food are not the same. Too funny! Real mashed potatoes are sooooo good and I can see why they elicit cheers if you are used to what comes in the box. Sour cream is a delicious addition! I suppose, lol. It was just funny to see them so excited over something so ordinary. Thank you, Jeannee. I’m with your husband – say NO to instant mashed potatoes, lol. Thanks for stopping by! Michelle, my daughter still wants me to bring her my mashed potatoes when she’s not feeling well, and she’s 31, lol. She thinks they’re magical, ha! Yay!!! Thanks for trusting me (’cause sometimes I don’t, lol). WOW we’re basically using the same recipe. Boxes mash is not mash, only my personal view. I am also running a monthly Share and Inspire Others! Recipe Exchange and would like to personally invite you to participate. It will be awesome. P,ease email me your entry midnight Feb 10th. And it seems we run a similar cooking game too, ha! I’d be happy to participate, although I don’t have many bread recipes (weird, but true). Thanks Jas, received your email and responded. I make mine from scratch too, although I have never added sour cream. I’ve heard of adding a little mayonnaise (which I’ve never tried), but on special occasions I use garlic butter, or ranch dressing or dip. Cheese can also be added. I often use ranch dip in place of sour cream on baked potatoes, too. There are many ingredients you can add, although I have never tried mayonnaise myself. This recipe is my favorite because it’s my mom’s recipe and you know nothing beats mom’s food, no matter how old you are. It is simple enough and it doesn’t change the original flavor, but don’t get me wrong – I do love me some garlic mashed potatoes too! Yum, my mouth is watering! These look delicious! I never use sour cream in mine but, might have to try that sometime. Thanks for sharing at the Inspiration Spotlight party. Pinned & Shared. Hope you do, Theresa! 🙂 Have a great rest of the day! Hah Jas. That was so funny. Sometimes people just like simple comfort food and not any sort of fancy stuff. I made a fancy lasagna for my son recently but he didn’t want it. You go figure. I will definitely be adding your special ingredient to mine next time. I love to add quite a bit more sour cream too, it’s just that I’m watching my girlish figure….grow, lol. I’ll try adding garlic powder next time, bet it’s awesome! Your Mashed Potatoes look amazing! Happy Valentine Day and thanks so much for sharing your awesome talent with us at Full Plate Thursday! Yummy! I haven’t tried adding sour cream, but I have added heavy cream and chives. Thanks for sharing at Funtastic Friday. Mashed Potatoes are big in my house. I love your recipe. Please share on my Sunday’s Best linkup. Starts every Saturday at 8:00 PM EST.